Can its determined inhabitants save a dying country town? Four different writers tell the story of Mindalby, a beautiful country town threatened with extinction when its cotton mill closes. Sasha comes to the small town of Mindalby to recover from a traumatic event with vengeance on her mind – the last thing she wants is a relationship. Local single dad, Cole, is drawn to this smart determined nurse, but could Sasha' secrets destroy the relationship before it has begun? When fashion designer Serena Quinlan arrives in Mindalby for the annual cotton festival she meets local leather worker Paul Carey and commissions him to create accessories for her designs. Their mutual attraction is powerful, but hampered by Serena's search for her father and the arrival of her ex–fiance. When Serena uncovers the truth of her birth, will it blow their budding relationship apart? Asher is struggling to keep her head above water. With her job at the real estate agent, her father's addiction to the bottle, her absentee mother's increasingly pushy text messages and trying to be a good mum to daughter Dakota, she has no time for relationships…even if Flynn Carmichael is the most beautiful man she's ever seen. Lynsey Carter's relationship with her father is fraught, so when she hears that the cotton mill that is her birthright has closed down (and her father is lying low), she returns to Mindalby to support her mother and seek out answers. Torn between family loyalty and duty to the community and an old passion for Julian Stone, her high school sweetheart, Lynsey has a lot to deal with. More than that, she has built a life for herself away from Mindalby. How can she stay there now? 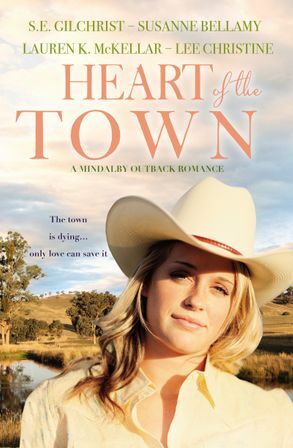 Born and raised in Toowoomba, Susanne is an Australian author of contemporary and rural romances set in Australia and exotic locations. She adores travel with her husband, both at home and overseas, and weaves stories around the settings and people she encounters. Her Outback series, Hearts of the Outback, and Second Chance Love, one of the Bindarra Creek series with other authors, were inspired by her time teaching in far north-west Queensland. Her heroes have to be pretty special to live up to her real life hero. He saved her life then married her. They live on the edge of the Range with their German Shepherd, Freya. In another life, Susanne was a senior English and Drama teacher with a passion for Shakespeare and creative writing, but now her two children have flown the coop, she writes full time. Susanne is a member of the RWA (Romance Writers of Australia) and won third place in their 2011 Emerald Award. She placed third in the Pan Macmillan short story competition with Chez Romeo. A hybrid author, she is published with Mira, and Harlequin Escape, as well as being self published. A popular guest speaker, she presented the keynote address at the Steele Rudd Pilgrimage, and was a guest speaker for the Dynamic Life Speakers Series for U3A, and has been invited to speak in libraries, at book clubs, and to community groups. To find out more, visit Susanne on her website. You can also follow Susanne on Facebook, Twitter, Youtube and Pinterest. SE can't remember a time when she didn't have a book in her hand. Now she writes her own stories where her favourite words are ...'what if' and 'where'? She combines passionate romance with action and adventure set in dangerous worlds. Her heroines are valiant and know exactly what to do with their alpha heroes. She writes in the romance genres of sci fi / futuristic, fantasy, post apocalyptic/dystopian, ancient history. An Aussie to her backbone, SE lives down-under, in the beautiful Hunter Valley of Australia. Lauren McKellar grew up in a beachside town north of Sydney, Australia. A self-confessed nerd, Lauren spends every spare second she has writing books and hungrily devouring new releases from her favourite authors. With a passion for Young Adult and New Adult fiction, she especially loves stories that are real and flawed. Lauren is a magazine editor and freelance fiction editor. She juggles her time between editing, writing, and going for long walks on the beach with her partner and their two puppies. She loves to meet new people, so feel free to chat with her on Twitter, Facebook, or on her blog.